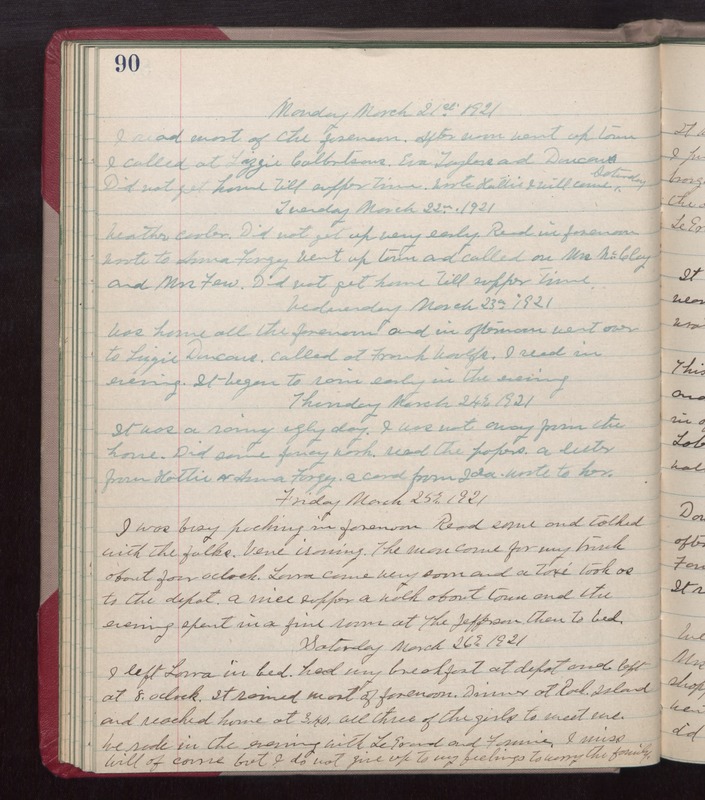 Monday March 21st 1921 I read most of the forenoon. After noon went up town I called at Lizzie Culbertsons, Eva Taylors, and Duncans. Did not get home till supper time. Wrote Hattie I will come Saturday. Tuesday March 22nd 1921 weather cooler. Did not get up very early. Read in forenoon. Wrote to Anna Forgy. went up town and called on Mrs McClay and Mrs Few. Did not get home till supper time. Wednesday March 23rd 1921 Was home all the forenoon and in afternoon went over to Lizzie Duncans. Called at Frank Woolfs. I read in evening. It began to rain early in the evening. Thursday March 24th 1921 It was a rainy ugly day. I was not away from the house. Did some fancy work. Read the papers. A letter from Hattie & Anna Forgy. A card from Ida. Wrote to her. Friday March 25th 1921 I was busy packing in forenoon. Read some and talked with the folks. Vene ironing. The man came for my truck about four oclock. Laura came very soon and a taxi took us to the depot. A nice supper, a walk about town and the evening spent in a fine room at The Jefferson then to bed. Saturday March 26th 1921 I left Laura in bed, had my breakfast at depot and left at 8 oclock. It rained most of forenoon. Dinner at Rock Island and reached home at 3.40. All three of the girls to meet me. We rode in the evening with LeGrand and Fannie. I miss Will of course but I do not give up to my feelings to worry the family.